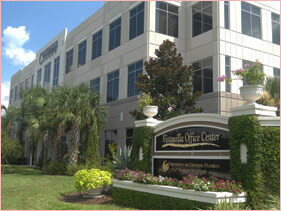 Our corporate office is located in Winter Springs, Florida. Drive north on Jeff Fuqua Blvd. (If you exit to the south from the rental car facility, the access road circles the airport. Simply follow the signs towards the north exit of the airport.) Do not stay in the far right lane until you see the signs for the FL-528 East exit, or you will exit onto the cargo access road. When you see the sign for FL-528 East, exit towards Cocoa/Kennedy Space Center. In 4.3 miles, take Exit 16 on the right for FL-417 North (Toll Road). Keep to the left after exiting towards Sanford. After 18.4 miles, take Exit 44 to FL-434 West. At the bottom of the exit ramp keep left and turn left under the bridge. After going under the bridge, you will see the Vistawilla Office Center on your left. Proceed 0.4 miles to the traffic light and turn left onto Spring Avenue. Turn left again at the first left, travel behind the Hess gasoline station straight into the Vistawilla Office Center parking lot.